I don’t often write reviews of books I read but Stephen King is different, for reasons which I have doubtless already set down elsewhere. You see I started young with Stephen King and I have never-ever stopped. I read Salem’s Lot in ’76 when I was 13 and, with the exception of some of the ‘Dark Tower’ series, I’ve since read everything he’s ever written. So, like many other people in the world, I perhaps feel that I have a stake in Stephen King (no pun intended, not really) and that I know his work pretty well. For this reason, I like to write at least a note about his new books after I read them. One of the difficulties that Stephen King has, in his real world, is with people who think they own a piece of his soul because they’ve read all his books. I’m not one of those. The reason I think I can write about his books with some insight is different for me. It’s simple, it’s this: I don’t like them all. I like reading them, I like his style and I love his story-weaving skill but all of the books have not set me alight, not by any means. And this one, this new one ’11.22.63’ well, it had me a bit excited. The premise, you see, it seemed to portend that Stephen was veering off into unknown territory, that a historical/political perspective would be incorporated into the novel which would break new ground in his writing and garner him a larger chunk of the respect and love he undoubtedly deserves. I requested the book for Christmas, got it and launched in. I will do what I always do now – I will tell you what I thought of it but, perhaps annoyingly, I won’t tell you the story of the book. Lots of reviewers seem to take up two-thirds of their piece doing that and I don’t see the point. Here, though, in one sentence, is the gist of the story. 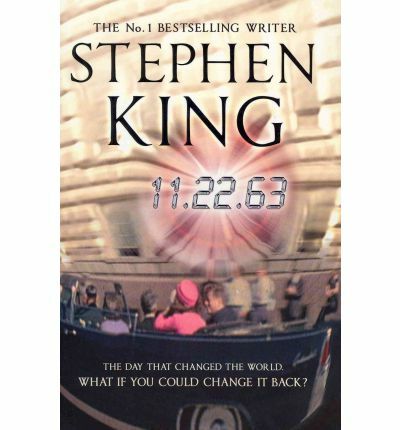 A man finds a time portal and travels back to exact change on history, primarily to stop the assassination of JFK on ’11.22.63’. Stephen King always does this for me. He writes in such a lovely way and he weaves his story in such a lovely way that I am invariably drawn-in and involved and entertained and encouraged to read on. He is, in my opinion, a magical writer. He gives himself colossal problems in his stories and then he solves them without flinching away from them. So, again, I loved reading this book. It provided me with a highly-enjoyable reading experience through every single page and, as a reader who has seen some dry times this past year, I am enormously grateful for that. Thank you, Mr. King, for making my reading of this book such an enjoyable thing that I oftentimes longed to get back to it. That's the best gift I can ever receive. There’s a ‘But’, though, isn’t there? This thing I expected – this historical/political veer-off into new unexplored territory… it didn’t happen. This is a Stephen King book, with all the Wonderful and Brilliant things which that statement implies. What it is not , however, is markedly different from his other books, in fact it is markedly the same. That, for me, was a wee bit disappointing. The Brave Everyman with the Tragic Past. The Lovely Girl Who You Cannot Help But Fall in Love with Along With The Brave Everyman. The Grizzled World-Wise Old Guy With The Rough Exterior and the Heart of Gold. We see them in so many of his books. And scenarios? At various times through the book, I felt I was revisiting other King novels. This, of course, is overtly done with the novel ‘IT’ because the town and some the characters actually reappear in what was, for me, a rather unsuccessful device. But I’m not talking about that, I’m talking about the ghosts of earlier stories which haunts these pages. The ghosts of ‘Christine’, ‘The Dead Zone’, ‘The Mist’ and others. For all the promise of this new high-concept premise, Stephen has not broken his mould in any meaningful way. Rather, he has made this new mould from salvaged bits of all the old moulds. This works and makes a good archetypal ‘Stephen King’ book but, alas, nothing more. This sounds churlish to me as I read it back. I enjoyed the book, what more should I want? The man has been grossly injured, suffers with eyesight, has written a Gazillion books… why should I have even wished for some radical new departure at this late stage of his wonderful career? I don’t know. I just did. The book is masterfully done. The writer could hardly have given himself a tougher narrative challenge – one man, alone, in the past for years-on-end – and he not only makes it work, he makes it work well. But there’s a certain tone that was prevalent in ‘Christine’ and also in ‘IT’, lurking behind all the comic-book horror shenanigans. It’s a tone that implies that there was a time, in the late 50’s and early 60’s, which was simply Perfect. Even though it was not, for this reason and this reason and this, it still just was. Perfect. It’s a gloss that King either can’t or won’t scratch too hard. Perhaps it’s just nostalgia, I don’t know. The entire mid-section of the novel is permeated with this ‘Everything Was Perfect’ sheen. No matter how horrible the action gets, it all still somehow remains… Perfect. Anyway. I loved reading this book much more than I loved the book. Sorry, but that's the best that I can do. well said...i completely agree with your review...just finished the book...very entertaining story but felt rehashed. Still will read his next one! Finished..as always with books I enjoy I dragged out the end, I didn't want it to end. However end it did, I am now a Stephen King convert, not that I had anything against him before, I just never got round to reading any of his books. My view hasn't changed since page 330 It was brilliant.I think the journey was better than the ending but as always I can't think of another way to end it. Great book indeed, looks like I've got a bit of catching up to do on his back catalogue!